Amazing Spider-man # 39 cgc 9.6, White Pg Unrestored 1st Romita, Stan Super Key! 1st Romita Spidey, Crossover White Pages!! 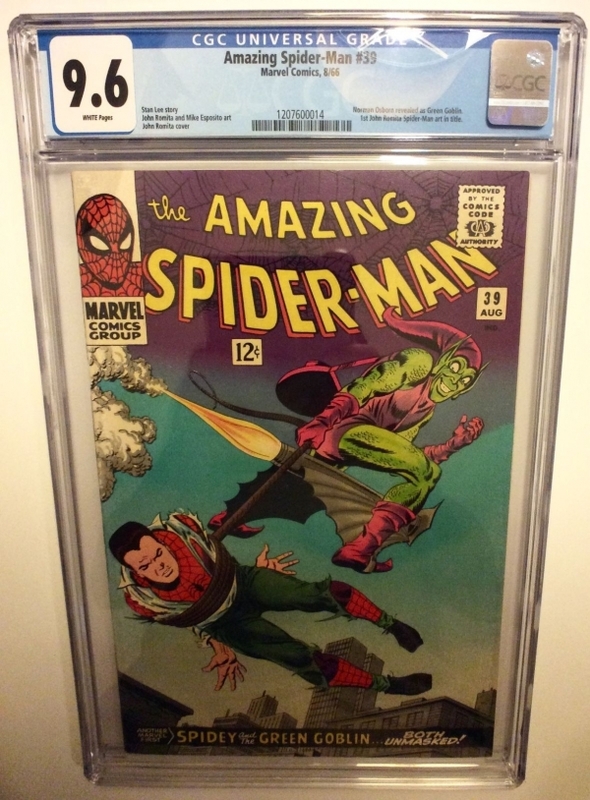 Up for a NO RESERVE auction is a CGC 9.6 copy of one of the most famous and important Spider-man books. This exceptional quality is unheard of in a book this old. This is a stunning copy. 1st John Romita spider-man cover and Key intro of Norman Osborn as Green Goblin. Only a handful exist in such a high grade and have been selling upwards of 6- 7K........Seeing as the book has not been pressed there is always a chance judge for yourself. Perfect as a center piece or to add to an amazing collection. Or get it signed and make it a one of a kind. This is of one of the hottest books around. You are bidding on a Beautiful Copy, an ICONIC and absolutely stunning Must have. These books have been increasing in value steadily and is without question a perfect addition for a, Romita, Spider-man or Marvel collector. Key book in the Marvel Universe!! It is nearly impossible to find Raw Copies of these that are worth grading.